The Kriega US-20 is an award-winning, high quality piece of motorcycle luggage, offering 20 liters of capacity. Like all Kriega US bags, it is a 100% waterproof Drypack with innovative design which attaches to the sub-frame, via included buckle loops and Alloy Hook Straps, for use as a motorcycle tail pack and courier bag. The Kriega US-20 motorcycle bag comes equipped with removable shoulder and waist straps. It can be carried courier style, on or off the bike. It can also be used as a tank bag (with addition of US Tank adaptor) or in combination with other US packs to create a supremely adaptable, modular, soft luggage system. 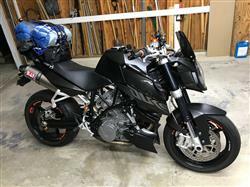 Anti-slip mesh base also doubles as a pocket to store the shoulder & waist straps, or other items, when the US-20 is attached to the motorcycle. The shoulder strap connects to the large D-rings at each end of the pack and the waist strap connects to 2 x tuck-away buckles at the corners of the mesh-pocket. The Kriega US-20 dry pack motorcycle tailpack is designed to work perfectly with pretty much any motorcycle, via a super secure attachment to the sub-frame. The pack is easily attached/removed by 4 x quick-release buckles, and no extra bungees or rain covers are required. The Kriega dry bag US-20 tail pack utilizes the latest generation of fitting straps. US Alloy Hook Straps allow tailpack combinations of up to 90-liters to be carried with confidence and convenience. Easy on/off with no loose straps remaining. Custom CNC milled, aircraft grade, 6061-T6 alloy hooks attach to the four discreet web loops located on the frame of the bike. Fitting method is particularly suitable for traditional one-piece motorcycle seats and bolt-on seat pads/racks, as well as standard seats. US packs can be mounted inline or across the seat. For use as a tankbag, Kriega US Tank Adaptor must be purchased. Very well made. Should last a lifetime. Trick strap system to attach bag to bike. Took 500 mile trip this weekend. Even with lots of other stuff attached to top of bag, straps stayed secure, never loosened. Holds a lot more stuff than it looks like. Packed for 2 days—clothes, shoes, toiletries, first aid kit and other misc and had room left over. Could easily fit 3 pants, several t-shirts, shoes and everything else you’d need for longer trip.